Intensivierungskonzepte bei Adjektiven und Adverben im Sprachenvergleich / Crosslinguistic Comparison of Intensified Adjectives and Adverbs. Sammelband von Guido Oebel (Hrsg./Ed. 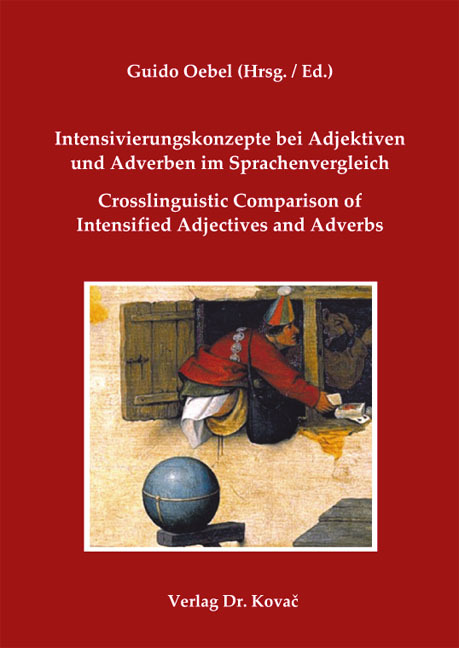 ), Verlag Dr. Kovač 2012, 436 S.
[...] The volume gives a very thorough overview of the topic of intensification in adjectives and adverbs with a crosslinguistic lookout. This also accounts for ist possible inventory-like usage, where the contributions of Hoeksema, Oebel, Brdar and Brdar-Szabó gain special importance. The balance between the language-historical and language-practical parts is ideal; the first section raises questions of which several are reflected upon in the second part. The lexical appendix is an invaluable help for scholarly interest. Although it is obviously first and foremost intended for linguists, some of the articles attain a cross-disciplinary relevance as well, possibly generating interest from other fields. Dieser Sammelband zur Adjektiv- bzw. Adverbintensivierung ist die Folgepublikation zum Anfang 2011 erschienenen „Wörterbuch der Volkssuperlative“ nebst Begleitband. Auf einen einleitenden sprachhistorischen Rückblick zu diesem Intensivierungsphänomen folgen u.a. aktuelle sprach(en)vergleichende Beiträge solch arrivierter Sprachwissenschaftler wie Jack Hoeksema (nl.-dt.-engl. ), Ricarda Liver (bündnerromanisch), Elisabeth Piirainen (europ. ), Rita Brdar Szab? und Mario Brdar (germ., roman., slaw., finno-ugrisch). Den dritten Teil bildet eine gegenüber der 2011er Version gründlich überarbeitete, tw. korrigierte und erweiterte Bibliographie zum behandelten Intensivierungsphänomen.